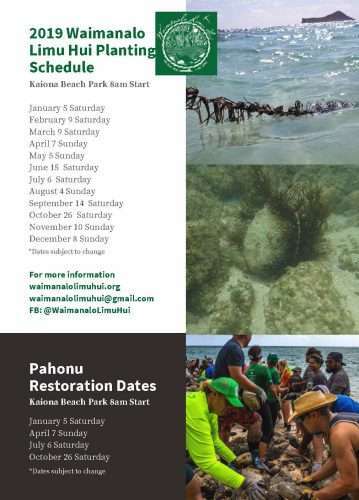 Support the restoration effort at Waikalua Loko Iʻa!! 7:00 Set-Up and Parking: Volunteers Needed! 8:15 Morning Circle: Introductions and Oli, Instructions/Assigning of work groups/Pond leaders, Work tools distributed, Go out to the work sites! 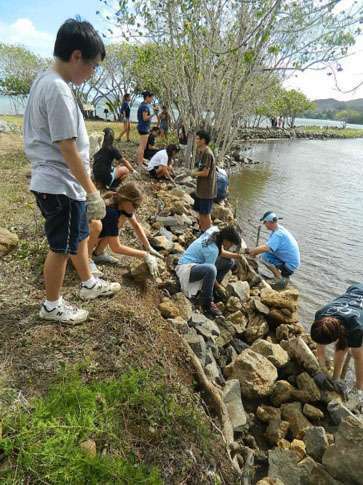 Remove limu from pond, pull mangrove keiki, cut mature mangrove, pass mangrove to chipper, and other restorative work. 11:30 Return from work sites and clean up: First, rinse off mud from body, tools, and gloves in the Ocean so we don’t waste fresh water at the hoses. Then do a final rinse of tools and gloves with fresh water, with pails provided. Hang gloves out on the line and place tools on picnic tables. If you have borrowed shoes, wash and hang on pegs to dry. 11:45 Pizza lunch! If you need a work certificate, they’ll be at the registration table at noon! 12:15 Assist with clean-up: Storing equipment and leaving everything tidy. Mahalo!